Double sided staple up reinforced radiant barrier is one of the best products on the market. Reflective insulation and radiant barrier with an emissivity of .05 and .03 blocks out over 95% and 97% of the suns radiant heat. It’s strong, helps with noise reduction as well as being a non-fibrous healthier material. The products of reflective insulated barriers works under attic decking, sub-floors, hot walls, on the backs of attic doors and pull down stairs. Residential radiant barrier works. Insulation Guru installs radiant barrier products in thousands of homes in the Houston and surrounding county areas. The return on investment comes quick with the staple up radiant barriers. If the Insulation Guru feels that the product wouldn’t benefit you, we let you know. This is a big step in energy efficiency. Give us a call and start saving and feeling better today. 713-228-4878. This superior product is what we consider to be the best of the best. Better emissivity value, better R-value, better noise reduction content, stronger materials, FDA approved for livestock and poultry, Adhered with a wire grid or custom clip system that can be painted to any color. Our product family of radiant barrier products can be used most anywhere. Insulation Guru carries them all and we are a certified applicator of reflective insulated products. It is the perfect commercial radiant barrier product. Insulation Guru continuously installs this product because it is fast becoming the reflective insulation of choice. Used in the Cameron warehouse in Magnolia, Texas. YMCA in Conroe, Texas. Best Sea Pack Incorporated in Danbury, Texas. 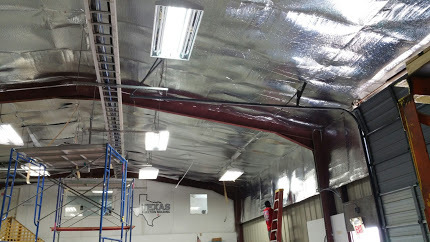 For smaller jobs and jobs where reflective barrier is not an option, The Insulation Guru will apply a radiant barrier or a ceramic insulation coating that is right for your needs. Insulation Guru is also a certified white roof insulated coating specialist. Blocking the heat from entering your warehouse or office in the first place is better way to keep the occupants inside cool. Houston, Texas and the surrounding Counties. When only the best will do, Call the Insulation Guru.